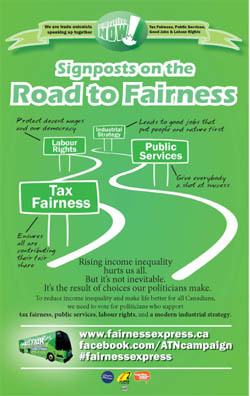 This small and easily distributed handbill uses the Fairness Express campaign's "Road to Fairness" concept to outline the All Together Now! campaign analysis of the major causes—and cures—of rising income inequality. Income inequality rises when a country travels a path towards unfair taxes, declining public services, eroded labour rights and no industrial strategy. Income inequality eases when we head instead for tax fairness, quality public services, labour rights and a modern industrial strategy.